I have the great pleasure to be sharing a crowdsourced labor of love, the first book of prayers that the Open Siddur Project has completely proofread on Wikisource: Stunden Der Andacht (Hours of Devotion) by Fanny Schmiedl Neuda, first published in 1855. I initially prepared the transcription from the 145-page, 1858 edition of Stunden Der Andacht with Tesseract-OCR (using the VietOCR user interface) and a scan of the book made by Google Books. Many thanks to Open Siddur Project contributor and volunteer, Chajm Guski, for helping to upload the transcription to the German Wikisource site. Many thanks go to the untold numbers of volunteer proofreaders, both veteran Wikisource volunteers as well as the many folk who came to proofread the text after seeing a tweet, Facebook status update, or reading an email asking for German fluent readers for help. 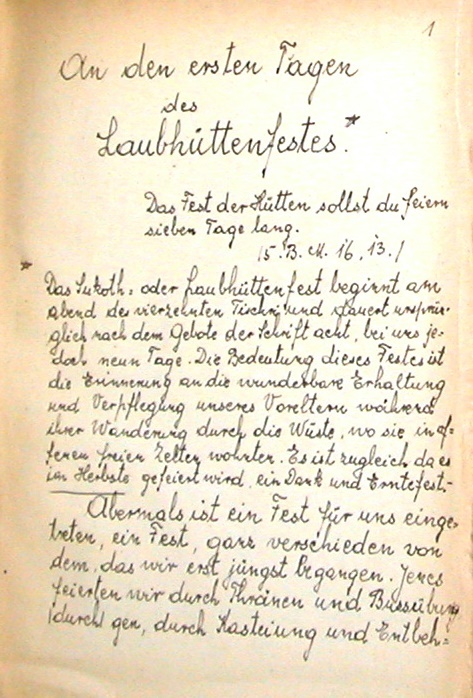 Neuda’s collection of Jewish prayers is unique by virtue of its being the first collection of Jewish prayers composed in German by a Jewish woman. Earlier collections of teḥinnot — petitionary prayers, comprising a growing literature of devotional works for prayer outside of the shul had been authored by Jewish men and less commonly by Jewish women. (See the prayer of Glückel of Hameln (1646-1724) translated by Kaeren Fish in A Jewish Women’s Prayer Book (e.d. 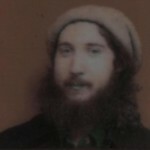 Aliza Lavie 2008)). 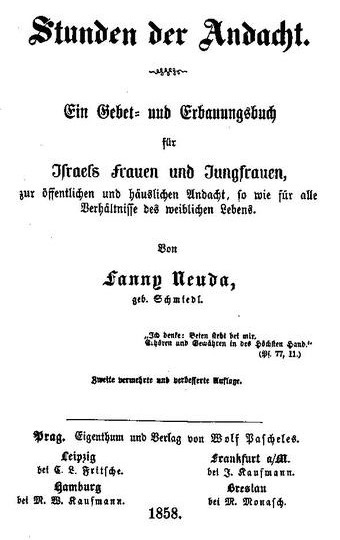 After Neuda’s work was published in 1855, it attained such great popularity among Jewish women in Central Europe, that it was published in more than 30 editions (some of which were illustrated).The YIVO Encyclopedia of Jews in Eastern Europe, article on Fanny Neuda Schmiedl, accessed August 24, 2011. At least one siddur published by Raphael Jacob Fürstenthal in 1897 appended her complete Stunden Der Andacht to it. 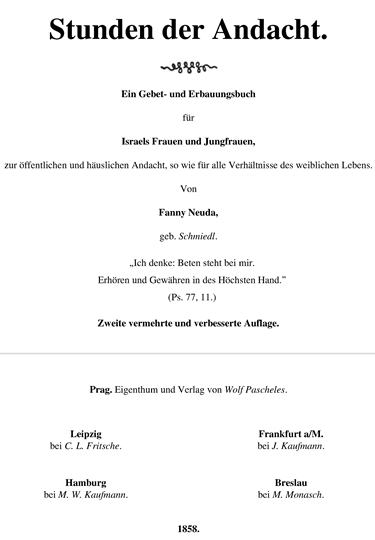 “Stunden Der Andacht (Fanny Schmiedl Neuda, 1855)” is shared by Aharon N. Varady (transcription) with a Creative Commons Public Domain Dedication 1.0 Universal license. Please reciprocate for any adaptation or redistribution of this work by (1) properly attributing the work to Aharon N. Varady (transcription) and Fanny Schmiedl-Neuda, (2) clearly indicating the date you accessed the resource and whether any changes have been made (and if so, please be in touch with us and leave a comment below so that we might note your adaptation or improvement), (3) providing a link back to this source, and (4) specifying the Creative Commons Attribution-ShareAlike (CC BY-SA) 4.0 International copyleft license under which this work was shared. 2013-09-17 – 14 Tishri 5774 at 7:33 pm · Reply. Any english translations with or without commentary of this?..That would be wonderful..
2013-09-18 – 15 Tishri 5774 at 5:36 am · Reply. 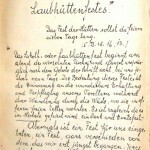 There are English language translations of Stunden der Andacht, the earliest being that of Rabbi Moritz Mayer’s Hours of Devotion (1866). Dinah Berland adapted Mayer’s translation and a new independent translation of some of the prayers was made by Katherine Fish for Aliza Lavie’s Prayerbook for Jewish Women (2008). Hinda Tzivia Eisen has published one of her translations of a prayer of Fanny Neuda at her blog, here.